I'm sorry for not writing to you for quite some time. But, you see, I have been working on a book together with my two colleagues and friends Daniel Deogun and Daniel Sawano. Late this summer we decided to try to write down our collective experiences and insights in design and security as a book. We are far from finished, but by now the first few chapters are released from the publisher Manning as part of their "Manning Early Access Program" (MEAP). 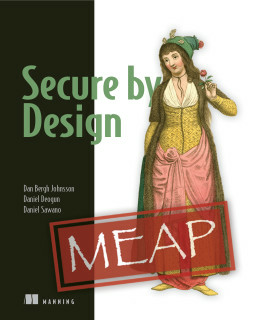 The book is named Secure by Design and our main message is how good design and good code can help developers avoid security problems. We have found that lots of security vulnerabilities are due to bugs that could have been avoided if the design of the code had been different. You as well as I know that it is a lot easier to think about "good design" when developing features, that it is to think "security" at the same time. Of course not all good design lead to avoiding security vulnerabilities. So we have gathered our experience on what design-tricks that are most effective in giving security as a side-effect. It's probably no big surprise to you that Domain-Driven Security is an important part of this, but there are many other parts as well. We still have a lot of material to cover. But, what we have started with things that are close to the code, such as building Domain Primitives, how to structure validation, immutability etc. I guess you will find several of these ideas familiar, as we have discussed them earlier - but there are also some new insights I have not yet had the time to write to you about. Well, not to mention all the ideas from Daniel and Daniel which you and I haven't had possibility to reflect on earlier. In the later parts there will be more material on integration, security benefits from cloud thinking. We also want to share our ideas around architecture such as security concerns for microservice architecture or how to handle legacy codebases. We will continue to write during the spring and early summer. Hopefully we will see the book in print sometime during the fall this year.